Dermaplaning is a safe and highly effective physical exfoliation procedure. It requires the use of a sterile, surgical scalpel to gently remove the vellus fluffy hair and the dead skin from the surface. Benefits of dermaplaning Physical exfoliation triggers the cell rejuvenation process and allows products to better penetrate skin. Some practitioners perform a chemical peel post-dermaplaning. Dermaplaning is also excellent to rid the face of excess fine hairs which can often accumulate dirt and oil. Contrary to popular belief, vellus hairs, as opposed to terminal hair, will not grow back thicker or darker. Microdermabrasion, which also physically exfoliates skin, does not remove vellus hair. Exfoliation of dead cells along with the removal of fine hairs results in healthier, brighter skin that has a smoother look and feel, reducing by half the amount of makeup needed on the skin. Who should consider dermaplaning? 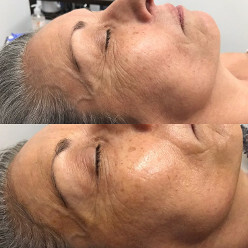 Dermaplaning is especially effective on those with dry or rough skin texture and helps to minimize superficial acne scarring, pigmentation,rejuvenation, fine lines and wrinkles, help minimize pore size etc. It is also beneficial for mature skin, which tends to have a buildup of dead cells as cellular turnover slows down with age. Dermaplaning is safe for pregnant or lactating clients who cannot have chemical peels (peels penetrate skin to act at the cellular level, thus are contraindicated). Those with very oily or active acne should avoid this procedure as well as anyone with thick, dark facial hair. How is Dermaplaning different from a peel? The treatment takes 35 - 45 minutes.